Sugar in Sodas and Diet Sodas | Eat Well. Be Well. A very popular topic in the nutrition and dietetics world, is sodas! Sodas are the number one source of added sugar in American diets and contribute to the obesity epidemic. 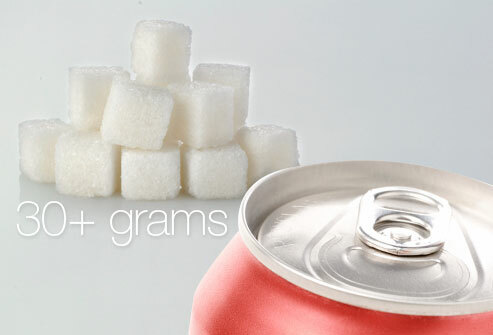 Sodas contain around 10-20 teaspoons of added sugar per can depending on size. The average recommended intake of added sugar per day is 8 teaspoons so drinking just one soda a day already exceeds those recommendations. About 48% of Americans consume sodas daily which is alarming considering the health risks involved when consuming a diet high in added sugar. Sodas can contribute to numerous health problems such as diabetes, obesity, tooth decay, heart disease, osteoporosis, and cancer. They do not provide any nutritional value and contain empty calories. Because of this, it is easier to consume excess food in addition to the soda you already drank. The bottom line is that by drinking sodas you are not giving your body the necessary nutrients you need. Diet sodas do not have any calories so they’re better than regular sodas, right? Unfortunately, this is not the case. People are enticed by the word “diet” and the fact that the nutrition label shows that these sodas have 0 calories and sugar. Diet sodas do not contain calories and sugar but they do have artificial sweeteners. The interesting thing about these artificial sweeteners is that it tricks your body into thinking you are consuming real sugar and therefore your insulin levels increase, which sends your body into fat storage mode and leads to weight gain. Knowing that sodas and diet sodas aren’t the best drink options for your health, you can always seek out other options. Try adding some fresh lemon to water or cucumbers to give it some natural fruit flavors. Or you can also choose tea and coffee with no added sugar. Now, if you are a daily soda drinker, try cutting down the number of sodas you drink per day or per week. Slowly, it will be easier to cut sodas completely out of your diet by doing it gradually. If you have any questions or comments about this topic, please feel free to post a comment on this blog!